A former Olympian and Calgary firefighter took to the waters of the Bow River on Wednesday to take on the unique challenge of paddling against the current in an effort to raise money and awareness about neurological disorders. Duff Gibson, who won the gold medal in 2006 for men’s skeleton, picked up his paddleboard to take on the challenge of paddling upstream from the Centre Street Bridge to the Bearspaw Dam, a full length of 22 km. He admits that it is an odd way to paddle on the water. Gibson’s journey was inspired by the challenge posed to his wife Jenn, who was diagnosed with multiple sclerosis three years ago. He’s working with the Branch Out Neurological Foundation, a group that provides grants in support of treatment for neurological issues that are separate from drug therapies. He says there are over 600 neurological diseases and while his wife’s case of MS is relatively mild so far, he hopes the work that Branch Out supports will help her sometime in the future. Jenn Gibson says she is touched by Duff’s commitment to helping out. So far, the early symptoms of her MS have not been too bad, but she supports Branch Out in the hopes of one day discovering a cure for the disease. As for paddling upriver, Duff says that fighting the current has had a good deal of challenges many that are much different than what he faced when he was in Turin. Duff’s campaign raised $9,200 as of Wednesday morning but they have the goal of $10,000 by the end of the day. For more information about Branch Out, visit the official website. 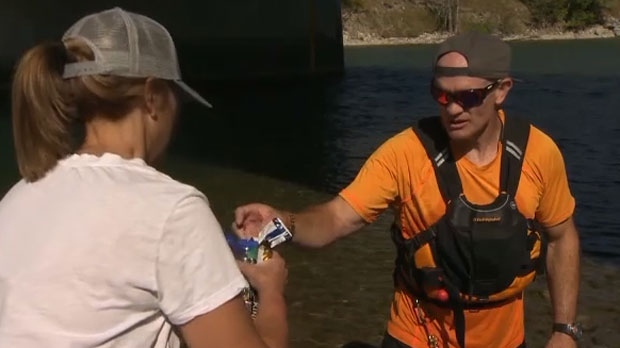 Duff Gibson paddled 22 km upstream on Bow River on Wednesday in support of the Branch Out Neurological Foundation, a group that provides funding for alternative therapies for neurological disorders.